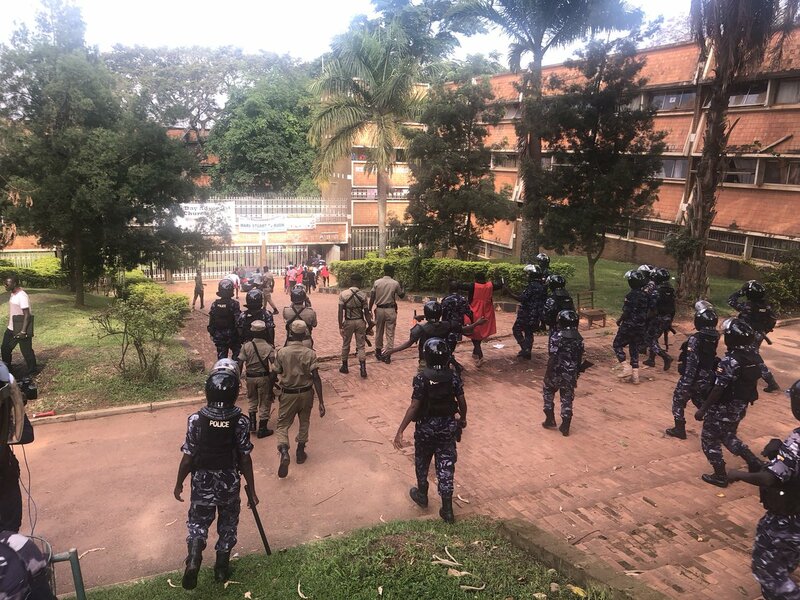 MAKERERE – There is heavy deployment of Police and military officers at Makerere University after students led by the guild leadership converged at the Freedom Square to discuss their plight following the lecturers’ strike that has lasted for three weeks. According to the Guild Representative Council for School of Business, Mr Hilary Nuwamanya, no lecture has ever taken place since the semester started three weeks ago. He said they had planned to converge in the Freedom Square to demand for their rights since they have already paid the tuition. “The minister of education told us that the situation is normal, but to date, we have never had lectures at our school. Management is busy confusing people that we are studying which is not true. We are here to demand for our rights,” Nuwamanya said. Four students have been arrested and police are still engaging in running battles with students. Some students were seen going to Wandegeya Police Station to rescue their colleagues who have been arrested while others were seen burning pieces of wood on the road. When we tried to get a comment from Police or management, calls went unanswered. Police and military remain heavily deployed at the university.